Someone so rightly said that you don’t know what awaits you tomorrow. As a kid when studying about mount fuji or Hiroshima-nagasaki I never thought of visiting these places. More so as Japan is not a huge travel destination for us Indians. But when this opportunity came along I was a little apprehensive mostly because we just shifted home and the kid’s schools didn’t allow any more leave than the puja holidays. But am glad that we grabbed it and I must confess that am loving every minute of my stay here. Every time I travel out of our country the thing that fascinates me the most is the freedom of movement. Which is almost unthinkable back home unless you have your own vehicle. But Japan is safe and has a method for everything. Its so easy to walk on the streets on Tokyo with a kid in a stroller, navigate in the city all alone or board a train to go anywhere my heart desires. Its all so safe with so many friendly people around. Wish things were a little easier for us back home. Unborn children's garden at Zojoji temple. Here rows of stone statues of children represent the unborn children of Japan, including miscarried, aborted and stillborn children. 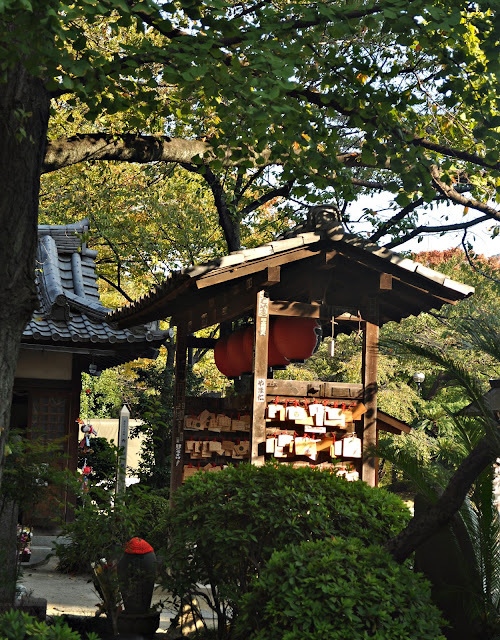 Parents can choose a statue in the garden and decorate it with small clothing and toys. 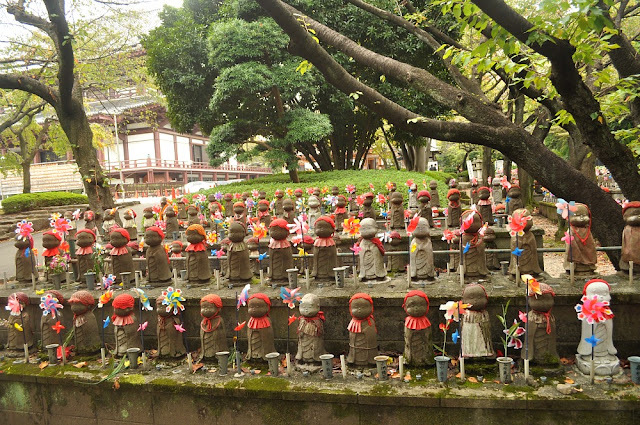 Usually the statues are accompanied by a small gift for Jizō, the guardian of unborn children to ensure that they are brought to the afterlife. Occasionally stones are piled by the statue, this is meant to shorten the amount of suffering a child has to go through on the way to the afterlife. Wiki. The only problem that seems pressing is the availability of familiar food. With CVS and lactose intolerance in the kid we cannot risk feeding him outside food especially most of the menus here are written in Japanese and is really difficult to find out what goes in the dish. And for that reason I have been cooking from day one. But Hubby and I are enjoying the restaurant food as much as possible. The Miso soups, hotpots or Nabe, bento meals and yakisoba tastes awesome and we look forward to try more of Japanese cuisine. We had brought with us almost all the Indian spices in moderate quantities to survive till we find local sources. 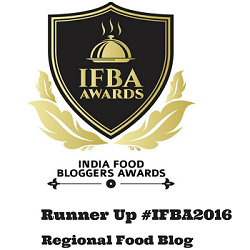 But as a food blogger I am using this opportunity to explore local ingredients too. Now that autumn is the best time for various types of mushrooms, am getting varieties of fungus to try. Will soon post some Japanese recipe but today I have a very quick and scrumptious Thai style Prawn curry which I made without the curry paste or the basic Thai curry ingredients like lemongrass or kaffir lime leaves. Try this and you will surely love this hot and spicy dish with a bowl of steamed rice. Peel and clean the prawns. Mix little salt and turmeric and keep aside. Do not throw away the prawn shells, as soon we will make a flavourful stock with that. 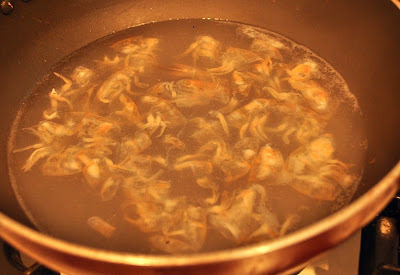 Take the washed prawn shells in a deep pot, add ¾ cup water to this and bring it to boil. Lower the heat, cover ad let it simmer for 3-4 minutes. Drain and reserve the stock. (I learnt this from my very talented blogger buddy Pree. This is a great way to intensify the prawn flavour). In the mean time chop the onion really fine and make a paste of the ginger, garlic and green chili and red chili powder. Also wash, de seed and cut the capsicum in thin strips. Grate the lemon skin and Set aside. Heat half of the oil in a pan and fry the prawns for 30 seconds on each side or till they turn opaque. Take out. In the same oil lightly sauté the pepper strips with a pinch of salt (max. for a minute) and set aside. Heat the rest of the oil, add a pinch of lemon rind. Stir and add the chopped onion. Sprinkle a pinch of salt and sauté this on low flame till this turn golden and mushy (approx. 5-6 minutes). Add the ginger garlic paste, turmeric powder and cook for another 2-3 minutes till oil starts to separate on the sides. Pour in the prawn stock and crank up the heat to bring it to a rapid boil. Add the rest of the lemon rind. Lower the heat and add the prawns, peppers and coconut milk. Mix everything and let it simmer on gentle heat for 2-3 minutes. Do not cover or you will loose the vibrant green colour of the peppers. Once the prawns are cooked switch off the flame. Add 11/2 tsps of lemon juice, adjust the seasoning and serve hot. If you have red curry paste then use that instead of cooking the onion-ginger-garlic. just mix 11/2 tbsps of paste with ½ cup coconut milk and ½ cup prawn stock or regular water and follow the rest of the recipe. 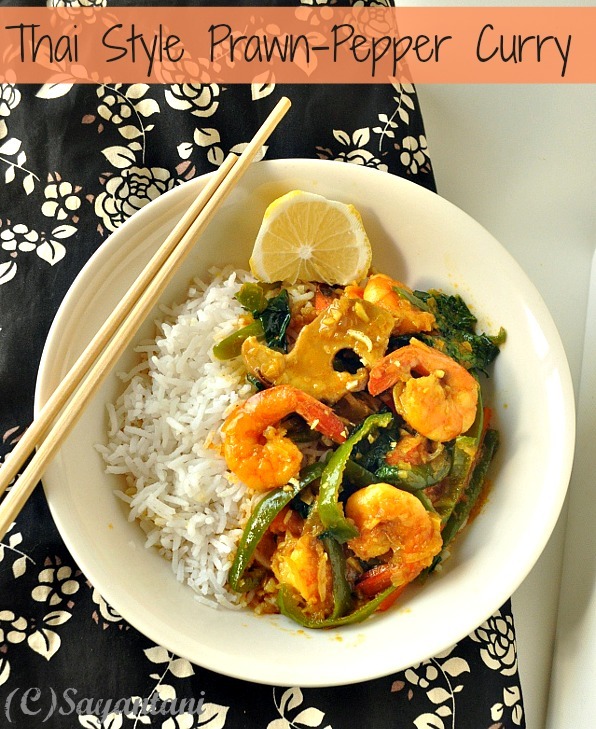 for homemade Thai red curry recipe go HERE. Make it vegan by using mushroom. Try using meaty varieties like button, shitake or king trumpet. You can also add mushrooms in this recipe as this recipe which inspired me to cook mine. I also added some Chinese mustard leaves the second time I cooked this curry. This adds a lot of fiber. To add leafy greens, chop them in medium chunks and add to the curry just before you switch off the heat. If you like add more sugar to adjust but the sweetness from coconut milk was enough for us to balance the gravy. 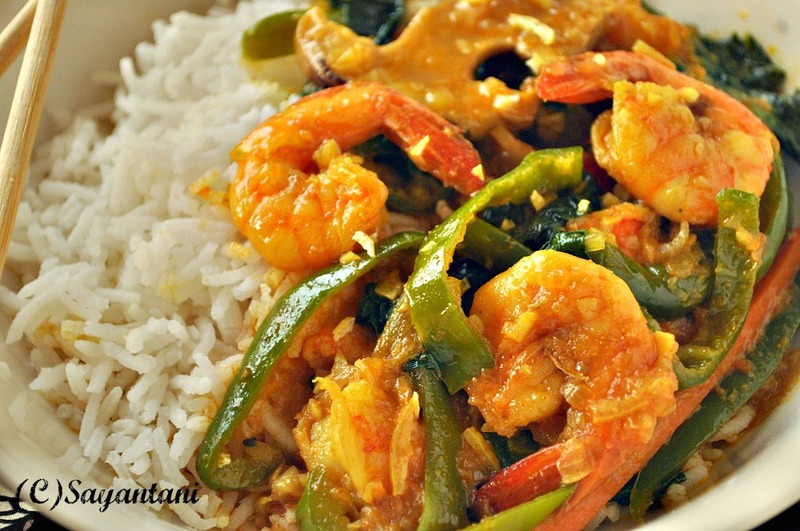 Totally scrumptious Sayantani and with basic ingredients which we can easily get... I love the idea of making stock with prawn shell, so new to me :) wonder how it would be will try it sometime... Seems like you love Japan and awaiting more lovely japanese food from you, its a cuisine I am trying to explore.. 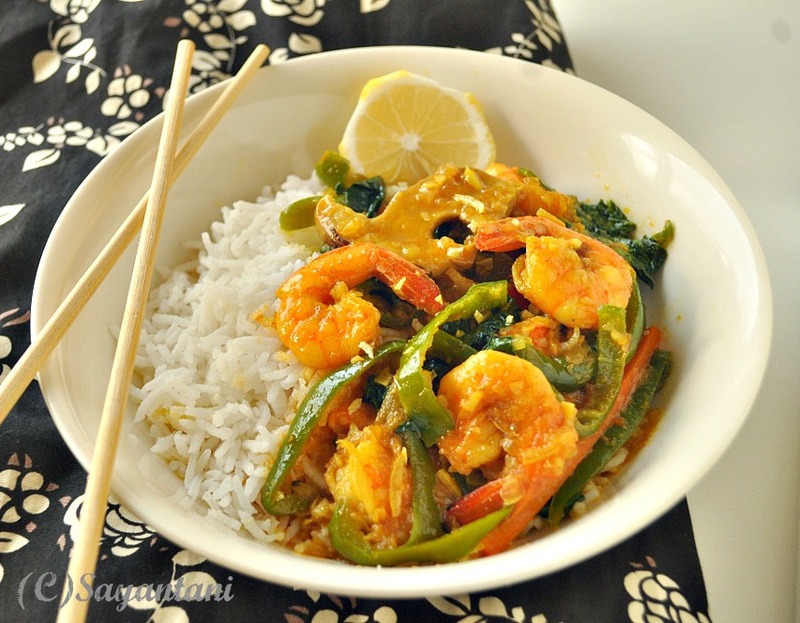 I love Thai recipes...and with my fav prawns....wow looks yummy yum!! First click is amazing. Never tried Prawns for my blog. bookmarking it to do. I wonder what you mean by CVS, but most Japanese food doesnot have any milk ingredients, so it should actually be really safe for you folks. Most of my Japanese friends do not include milk in their diet. some things you might really enjoy are Agedashi Tofu, (batter fried tofu), tempuras (veg and prawn fried in tempura batter) and some maki-sushi ... I don't know your familiarity or comfort level for japanese food, but almost all bengalis (me included) love sushi once introduced to it. Sushi doesnot always mean "raw" fish. You gotta try the local eateries! Love to visit Tokyo atleast once in my life, its my dream country, glad you are having wonderful time there. Give me that plate feel like finishing rite now.A prefect curry for a seafood lovers like me. Drooling here...Loved the delicious preparation and the beautiful presentation.. Thanks everyone for your comment. one thing I must clear out here is that by not eating out I meant we are not feeding the kid outside food. he has certain problems where its better for him to avoid unfamiliar food. @Tina. first of all thanks for your comment and am glad that in this process I got to find your beautiful blog. CVS is cyclic vomiting syndrome and along with that he also suffers from abdominal migraine. never heard of these diseases before but as a mother its so difficult to see my child suffer and vomit for hours. as we dont know what triggers this so we are a bit cautious and give him food that we know. I am cooking with a lot of japanese ingredients and he eats all that at home. but outside food we are a bit of cautious. The Hubby and I are enjoying the restaurant food especially the soups but then again I dont eat meat so its a bit of problem for me. just yesterday we had hotpot and now am frantically searching for the recipe so that I can reproduce this back home. 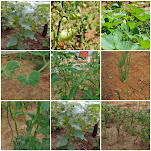 1st time here..you have very good recipes in your blog. Thanks Sayantani, sorry to learn about your baby! That is really trying for a family. 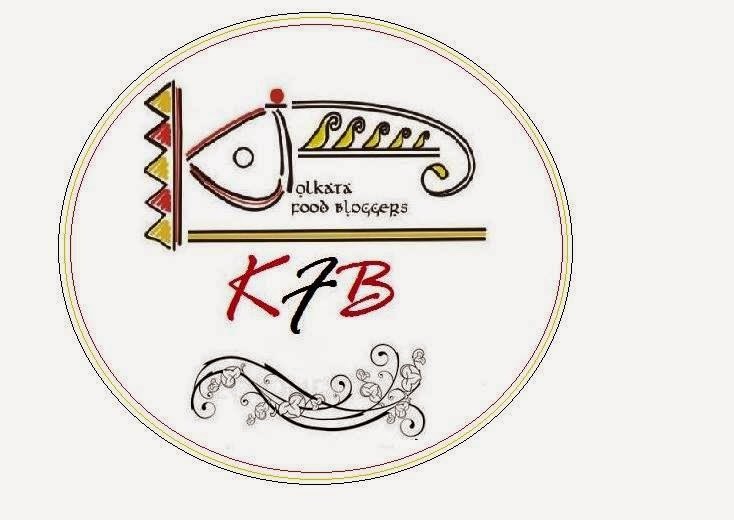 I wonder if you like most Bengalis exclude fish and seafood from the "meat" category (! ), because then you're in luck in Japan. I first tried sushi to impress a guy ( with much trepidation), since then my interest in sushi has far surpassed my interest in the guy. One of my favourite veg sushi is shiitake maki... I salivate at the very thought. Btw, I love your graphic design flair in your pictures. The rows of statues of children brings a shiver down my spine..such a ghastly reminder of disgusting and cruel human deeds. I wonder how it felt standing there. Loved the prawns. My hubby Vishal does exactly the same thing with his seafood to extract maximum flavours in the stock which he then uses in gravies. Sorry to hear about the little one..its the most helpless feeling when children get sick. You are such an amazing parent..stay strong. That particular photo that represents all unborn children of Japan is enough for anyone to get choking feeling in throat..Ektu sabdhane thakle-i bhalo chele'r khetre, tomra notun dishes try korte paro..Nice dish with prawns.. Awesome issues here. I am very happy to look your post. Thanκ уou so muсh and I'm taking a look forward to touch you. Will you kindly drop me a mail? joint ventures made up with the other 'gurus'.